Every room at the Prima Tel-Aviv Hotel is designed to provide incomparable standards of comfort. 40 newly designed standard rooms. The Hotel's Standard rooms are all renovated, refurnished and are capable of accommodating 2 adults or for single use. The rooms includes: air conditioning, bath tub, cable TV, coffee & tea making facilities, hairdryer, personal safe, mini refrigerator and wireless internet (with additional charge). 20 deluxe sea view rooms with sitting area. The hotel’s deluxe rooms are perfect for families or couples with panoramic windows facing the Mediterranean Sea and offering a spectacular view of Tel Aviv’s sea shore and promenade. The rooms includes: air conditioning, bath tub, cable TV, coffee & tea making facilities, hairdryer, personal safe, mini refrigerator and wireless internet (with additional charge). The Prima Hotel Tel Aviv is located on the shores of the Mediterranean Sea, in the epicenter of one of Israel's most vibrant cities. 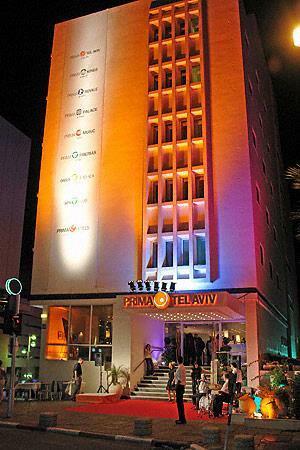 Only a short walk away from Tel-Aviv's downtown, the Prima Tel-Aviv Hotel is a perfect start from which one may visit and enjoy all the indulgence the city offers. "I only stayed in the Prima for one night but it was a very pleasant stay. We had a breath taki..."